A sound film is a motion picture with synchronized sound, or sound technologically coupled to image, as opposed to a silent film. The first known public exhibition of projected sound films took place in Paris in 1900, but it would be decades before reliable synchronization was made commercially practical. The first commercial screening of movies with fully synchronized sound took place in New York City in April 1923. In the early years after the introduction of sound, films incorporating synchronized dialogue were known as "talking pictures," or "talkies." The first feature-length movie originally presented as a talkie was The Jazz Singer, released in October 1927. By the early 1930s, the talkies were a global phenomenon. In the United States, they helped secure Hollywood's position as one of the world's most powerful cultural/commercial systems. In Europe (and, to a lesser degree, elsewhere) the new development was treated with suspicion by many filmmakers and critics, who worried that a focus on dialogue would subvert the unique aesthetic virtues of soundless cinema. In Japan, where the popular film tradition integrated silent movie and live vocal performance, talking pictures were slow to take root. In India, sound was the transformative element that led to the rapid expansion of the nation's film industry—the most productive such industry in the world since the early 1960s. 1.3 Triumph of the "talkies"
The motion picture has become the most dominant narrative art form of the late twentieth and early twenty-first centuries. Image from the Dickson Experimental Sound Film (1894 or 1895), produced by W.K.L. 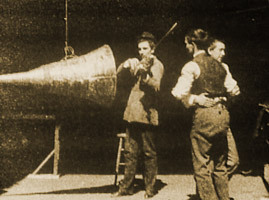 Dickson as a test of the early version of the Edison Kinetophone, combining the Kinetoscope and phonograph. The idea of combining motion pictures with recorded sound is nearly as old as the concept of cinema itself. On February 27, 1888, a couple of days after photographic pioneer Eadweard Muybridge gave a lecture not far from the laboratory of Thomas Edison, the two inventors privately met. Muybridge later claimed that on this occasion, six years before the first commercial motion picture exhibition, he proposed a scheme for sound cinema that would combine his image-casting zoopraxiscope with Edison's recorded-sound technology. No agreement was reached, but within a year Edison commissioned the development of the Kinetoscope, essentially a "peep-show" system, as a visual complement to his cylinder phonograph. The two devices were brought together as the Kinetophone in 1895, but individual, cabinet viewing of motion pictures was soon to be outmoded by successes in film projection. In 1899, a projected sound-film system known as Cinemacrophonograph or Phonorama, based primarily on the work of Swiss-born inventor François Dussaud, was exhibited in Paris; similar to the Kinetophone, the system required individual use of earphones. An improved cylinder-based system, Phono-Cinéma-Théâtre, was developed by Clément-Maurice Gratioulet and Henri Lioret of France, allowing short films of theater, opera, and ballet excerpts to be presented at the Paris Exposition in 1900. 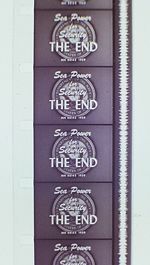 These appear to be the first publicly exhibited films with projection of both image and recorded sound. Synchronization–The pictures and sound were recorded and played back by separate devices, which were difficult to start and maintain in synchronization. Playback volume–While motion picture projectors soon allowed film to be shown to large theater audiences, audio technology before the development of electric amplification could not project to satisfactorily fill large spaces. Recording fidelity–The primitive systems of the era produced sound of very low quality unless the performers were stationed directly in front of the cumbersome recording devices (acoustical horns, for the most part), imposing severe limits on the sort of films that could be created with live-recorded sound. Cinematic innovators attempted to cope with the fundamental synchronization problem in a variety of ways; an increasing number of motion picture systems relied on gramophone records–known as sound-on-disc technology; the records themselves were often referred to as "Berliner discs," not because of any direct geographical connection, but after one of the primary inventors in the field, German-American Emile Berliner. Léon Gaumont had demonstrated a system involving mechanical synchronization between a film projector and turntable at the 1900 Paris Exposition. In 1902, his Chronophone, involving an electrical connection Gaumont had recently patented, was demonstrated to the French Photographic Society. Four years later, he introduced the Elgéphone, a compressed-air amplification system based on the Auxetophone, developed by British inventors Horace Short and Charles Parsons. Despite high expectations, Gaumont's sound innovations had only limited commercial success–though improvements, they still did not satisfactorily address the three basic issues with sound film and were expensive as well. For some years, American inventor E. E. Norton's Cameraphone was the primary competitor to the Gaumont system (sources differ on whether the Cameraphone was disc- or cylinder-based); it ultimately failed for many of the same reasons that held back the Chronophone. By the end of 1910, the groundswell in sound motion pictures had subsided. [I]t was a double system, that is, the sound was on a different piece of film from the picture…. In essence, the sound was captured by a microphone and translated into light waves via a light valve, a thin ribbon of sensitive metal over a tiny slit. The sound reaching this ribbon would be converted into light by the shivering of the diaphragm, focusing the resulting light waves through the slit, where it would be photographed on the side of the film, on a strip about a tenth of an inch wide. Though sound-on-film would eventually become the universal standard for synchronized sound cinema, Lauste never successfully exploited his innovations, which came to an effective dead end. In 1913, Edison introduced a new cylinder-based synch-sound apparatus known, just like his 1895 system, as the Kinetophone; instead of films being shown to individual viewers in the kinetoscope cabinet, they were now projected onto a screen. The phonograph was connected by an intricate arrangement of pulleys to the film projector, allowing—under ideal conditions—for synchronization. Conditions, however, were rarely ideal, and the new, improved Kinetophone was retired after little more than a year. In 1914, Finnish inventor Eric Tigerstedt was granted German patent 309,536 for his sound-on-film work; that same year, he apparently demonstrated a film made with the process to an audience of scientists in Berlin. Other sound films, based on a variety of systems, were made before the 1920s, mostly of performers lip-synching to previously made audio recordings. The technology was far from adequate to big-league commercial purposes, and for many years the heads of the major Hollywood film studios saw little benefit in producing sound motion pictures. Thus such films were relegated, along with color movies, to the status of novelty. Advanced sound-on-film–In 1919, American inventor Lee De Forest was awarded several patents that would lead to the first sound-on-film technology with commercial application. In De Forest's system, the sound track was photographically recorded on to the side of the strip of motion picture film to create a composite, or "married," print. If proper synchronization of sound and picture was achieved in recording, it could be absolutely counted on in playback. Over the next four years, he improved his system with the help of equipment and patents licensed from another American inventor in the field, Theodore Case. At the University of Illinois, Polish-born research engineer Joseph Tykociński-Tykociner was working independently on a similar process. On June 9, 1922, he gave the first reported U.S. demonstration of a sound-on-film motion picture to members of the American Institute of Electrical Engineers. As with Lauste and Tigerstedt, Tykociner's system would never be taken advantage of commercially; De Forest's, however, soon would. On April 15, 1923, at New York City's Rivoli Theater, came the first commercial screening of motion pictures with sound-on-film, the future standard: a set of shorts under the banner of De Forest Phonofilms, accompanying a silent feature. That June, De Forest entered into an extended legal battle with an employee, Freeman Harrison Owens, for title to one of the crucial Phonofilm patents. Although De Forest ultimately won the case in the courts, Owens is today recognized as a central innovator in the field. The following year, De Forest's studio released the first commercial dramatic film shot as a talking picture–the two-reeler Love's Old Sweet Song, directed by J. Searle Dawley and featuring Una Merkel. Phonofilms' stock in trade, however, was not original dramas but celebrity documentaries, popular music acts, and comedy performances. President Calvin Coolidge, opera singer Abbie Mitchell, and vaudeville stars such as Phil Baker, Ben Bernie, Eddie Cantor, and Oscar Levant appeared in the firm's pictures. Hollywood remained suspicious, even fearful, of the new technology. As Photoplay editor James Quirk put it in March 1924, "Talking pictures are perfected, says Dr. Lee De Forest. So is castor oil." De Forest's process continued to be used through 1927 in the United States for dozens of short Phonofilms; in the UK it was employed a few years longer for both shorts and features by British Sound Film Productions, a subsidiary of British Talking Pictures, which purchased the primary Phonofilm assets. By the end of 1930, the Phonofilm business would be liquidated. In Europe, others were also working on the development of sound-on-film. In 1919, the same year that DeForest received his first patents in the field, three German inventors patented the Tri-Ergon sound system. On September 17, 1922, the Tri-Ergon group gave a public screening of sound-on-film productions—including a dramatic talkie, Der Brandstifter (The Arsonist)—before an invited audience at the Alhambra Kino in Berlin. By the end of the decade, Tri-Ergon would be the dominant European sound system. In 1923, two Danish engineers, Axel Petersen and Arnold Poulsen, patented a system in which sound was recorded on a separate filmstrip running parallel with the image reel. Gaumont would license and briefly put the technology to commercial use under the name Cinéphone. It was domestic competition, however, that would lead to Phonofilms' eclipse. By September 1925, De Forest and Case's working arrangement had fallen through. The following July, Case joined with Fox Film, Hollywood's third largest studio, to found the Fox-Case Corporation. The system developed by Case and his assistant, Earl Sponable, given the name Movietone, thus became the first viable sound-on-film technology controlled by a Hollywood movie studio. The following year, Fox purchased the North American rights to the Tri-Ergon system, though the company found it inferior to Movietone and virtually impossible to integrate the two different systems to advantage. In 1927, as well, Fox retained the services of Freeman Owens, who had particular expertise in constructing cameras for synch-sound film. Advanced sound-on-disc–Parallel with improvements in sound-on-film technology, a number of companies were making progress with systems in which movie sound was recorded onto phonograph discs. In sound-on-disc technology from the era, a phonograph turntable is connected by a mechanical interlock to a specially modified film projector, allowing for synchronization. In 1921, the Photokinema sound-on-disc system developed by Orlando Kellum was employed to add synchronized sound sequences to D. W. Griffith's failed silent film Dream Street. A love song, performed by star Ralph Graves, was recorded, as was a sequence of live vocal effects. Apparently, dialogue scenes were also recorded, but the results were unsatisfactory and the film was never publicly screened incorporating them. On May 1, 1921, Dream Street was rereleased, with love song added, at New York City's Town Hall theater, qualifying it—however haphazardly—as the first feature-length film with a live-recorded vocal sequence. There would be no others for more than six years. In 1925, Warner Bros., then a small Hollywood studio with big ambitions, began experimenting with sound-on-disc systems at New York's Vitagraph Studios, which it had recently purchased. The Warner Bros. technology, named Vitaphone, was publicly introduced on August 6, 1926, with the premiere of the nearly three-hour-long Don Juan; the first feature-length movie to employ a synchronized sound system of any type throughout, its soundtrack contained a musical score and sound effects, but no recorded dialogue–in other words, it had been staged and shot as a silent film. Accompanying Don Juan, however, were eight shorts of musical performances, mostly classical, as well as a four-minute filmed introduction by Will H. Hays, president of the Motion Picture Association of America, all with live-recorded sound. These were the first true sound films exhibited by a Hollywood studio. Don Juan would not go into general release until February of the following year, making the technically similar The Better 'Ole, put out by Warner Bros. In October 1926, the first feature film with synchronized playback throughout to show to a broad audience. As sound-on-film technology improved, both of these disadvantages were overcome. Fidelity electronic recording and amplification–Beginning in 1922, the research branch of AT&T's Western Electric manufacturing division began working intensively on recording technology for both sound-on-disc and sound-on film. In 1925, the company publicly introduced a greatly improved system of electronic audio, including sensitive condenser microphones and rubber-line recorders. That May, the company licensed entrepreneur Walter J. Rich to exploit the system for commercial motion pictures; he founded Vitagraph, which Warner Bros. acquired a half interest in just one month later. In April 1926, Warners signed a contract with AT&T for exclusive use of its film sound technology for the redubbed Vitaphone operation, leading to the production of Don Juan and its accompanying shorts over the following months. During the period when Vitaphone had exclusive access to the patents, the fidelity of recordings made for Warners films was markedly superior to those made for the company's sound-on-film competitors. Meanwhile, Bell Labs—the new name for the AT&T research operation—was working at a furious pace on sophisticated sound amplification technology that would allow recordings to be played back over loudspeakers at theater-filling volume. The new moving-coil speaker system was installed in New York's Warners Theatre at the end of July and its patent submission, for what Western Electric called the No. 555 Receiver, was filed on August 4, just two days before the premiere of Don Juan. Late in the year, AT&T/Western Electric created a licensing division, Electrical Research Products Inc. (ERPI), to handle rights to the company's film-related audio technology. Vitaphone still had legal exclusivity, but having lapsed in its royalty payments, effective control of the rights was in ERPI's hands. On December 31, 1926, Warners granted Fox-Case a sublicense for the use of the Western Electric system in exchange for a share of revenues that would go directly to ERPI. The patents of all three concerns were cross-licensed. Superior recording and amplification technology was now available to two Hollywood studios, pursuing two very different methods of sound reproduction. The new year would finally see the emergence of sound cinema as a significant commercial medium. In February 1927, an agreement was signed by five leading Hollywood movie companies: the so-called Big Two—Paramount and MGM—a pair of studios in the next rank—Universal and the fading First National—and Cecil B. DeMille's small but prestigious Producers Distributing Corporation (PDC). The five studios agreed to collectively select just one provider for sound conversion. The alliance then sat back and waited to see what sort of results the forerunners came up with. In May, Warner Bros. sold back its exclusivity rights to ERPI (along with the Fox-Case sublicense) and signed a new royalty contract similar to Fox's for use of Western Electric technology. As Fox and Warners pressed forward with sound cinema in different directions, both technologically and commercially—Fox with newsreels and then scored dramas, Warners with talking features—so did ERPI, which sought to corner the market by signing up the five allied studios. The big sound film sensations of the year all took advantage of pre-existing celebrity. On May 20, 1927, at New York's Roxy Theater, Fox Movietone presented a sound film of the takeoff of Charles Lindbergh's celebrated flight to Paris, recorded earlier that day. In June, a Fox sound newsreel depicting his return welcomes in New York and Washington, DC, was shown. These were the two most acclaimed sound motion pictures to date. In May, as well, Fox had released the first Hollywood fiction film with synchronized dialogue: the short They're Coming to Get Me, starring comedian Chic Sale. After rereleasing a few silent feature hits, such as Seventh Heaven, with recorded music, Fox came out with its first original Movietone feature on September 23: Sunrise, by acclaimed German director F. W. Murnau. As with Don Juan, the film's soundtrack was comprised of a musical score and sound effects (including, in a couple of crowd scenes, "wild," nonspecific vocals). Then, on October 6, 1927, Warner Bros.' The Jazz Singer premiered. It was a smash box office success for the mid-level studio, earning a total of $2.625 million in the U.S. and abroad, almost a million dollars more than the previous record for a Warners film. Produced with the Vitaphone system, most of the film does not contain live-recorded audio, relying, like Sunrise and Don Juan, on a score and effects. When the movie's star, Al Jolson, sings, however, the film shifts to sound recorded on the set, including both his musical performances and two scenes with ad-libbed speech–one of Jolson's character, Jakie Rabinowitz (Jack Robin), addressing a cabaret audience; the other an exchange between him and his mother. Though the success of The Jazz Singer was due largely to Jolson, already established as one of America's biggest music stars, and its limited use of synchronized sound hardly qualified it as an innovative sound film (let alone the "first"), the movie's handsome profits were proof enough to the industry that the technology was worth the investment. The development of commercial sound cinema had proceeded in fits and starts before The Jazz Singer, and the film's success did not change things overnight. Not till May 1928 did the group of four big studios (PDC had dropped out of the alliance), along with United Artists and others, sign with ERPI for conversion of production facilities and theaters for sound film. Initially, all ERPI-wired theaters were made Vitaphone-compatible; most were equipped to project Movietone reels as well. Even with access to both technologies, however, most of the Hollywood companies remained slow to produce talking features of their own. No studio beside Warner Bros. released even a part-talking feature until the low-budget-oriented Film Booking Offices of America (FBO) premiered The Perfect Crime on June 17, 1928, eight months after The Jazz Singer. FBO had come under the effective control of a Western Electric competitor, General Electric's RCA division, which was looking to market its new sound-on-film system, Photophone. Unlike Fox-Case's Movietone and De Forest's Phonofilm, which were variable-density systems, Photophone was a variable-area system–a refinement in the way the audio signal was inscribed on film that would ultimately become the rule. (In both sorts of system, a specially designed lamp, whose exposure to the film is determined by the audio input, is used to record sound photographically as a series of minuscule lines. In a variable-density process, the lines are of varying darkness; in a variable-area process, the lines are of varying width.) By October, the FBO-RCA alliance would lead to the creation of Hollywood's newest major studio, RKO Pictures. Meanwhile, Warner Bros. had released three more talkies in the spring, all profitable, if not at the level of the The Jazz Singer: In March, The Tenderloin appeared; it was billed by Warners as the first feature in which characters spoke their parts, though only 15 of its 88 minutes had dialogue. Glorious Betsy followed in April, and The Lion and the Mouse (31 minutes of dialogue) in May. On July 6, 1928, the first all-talking feature, Lights of New York, premiered. The film cost Warner Bros. only $23,000 to produce, but grossed $1.252 million, a record rate of return surpassing 5,000 percent. In September, the studio released another Al Jolson part-talking picture, The Singing Fool, which more than doubled The Jazz Singer's earnings record for a Warners movie. This second Jolson screen smash demonstrated the movie musical's ability to turn a song into a national hit: by the following summer, the Jolson number "Sonny Boy" had racked up 2 million record and 1.25 million sheet music sales. September 1928 also saw the release of Paul Terry's Dinner Time, among the first animated cartoons produced with synchronized sound. After seeing it, Walt Disney decided to make one of his Mickey Mouse shorts, Steamboat Willie, with sound as well. Over the course of 1928, as Warner Bros. began to rake in huge profits due to the popularity of its sound films, the other studios quickened the pace of their conversion to the new technology. Paramount, the industry leader, put out its first talkie in late September, Beggars of Life; though it had just a few lines of dialogue, it demonstrated the studio's recognition of the new medium's power. Interference, Paramount's first all-talker, debuted in November. The process known as "goat glanding" briefly became widespread: soundtracks, sometimes including a smatter of post-dubbed dialogue or song, were added to movies that had been shot, and in some cases released, as silents. A few minutes of singing could qualify such a newly endowed film as a "musical." (Griffith's Dream Street had essentially been a "goat gland.") Expectations swiftly changed, and the sound "fad" of 1927 became standard procedure by 1929. In February 1929, 16 months after The Jazz Singer's debut, Columbia Pictures became the last of the eight studios that would be known as "majors" during Hollywood's Golden Age to release its first part-talking feature, Lone Wolf's Daughter. Most American movie theaters, especially outside of urban areas, were still not equipped for sound and the studios were not entirely convinced of the talkies' universal appeal—through mid-1930, the majority of Hollywood movies were produced in dual versions, silent as well as talking. Though few in the industry predicted it, silent film as a viable commercial medium in the United States would soon be little more than a memory. The final mainstream purely silent feature put out by a major Hollywood studio was the Hoot Gibson oater Points West, released by Universal Pictures in August 1929. One month earlier, the first all-color, all-talking feature had gone into general release: Warner Bros.' On with the Show! The Jazz Singer had its European sound premiere at the Piccadilly Theatre in London on September 27, 1928. According to film historian Rachael Low, "Many in the industry realized at once that a change to sound production was inevitable." On January 16, 1929, the first European feature film with a synchronized vocal performance and recorded score premiered: the German production Ich küsse Ihre Hand, Madame (I Kiss Your Hand, Madame). A dialogueless film that contains only a few minutes of singing by star Richard Tauber, it may be thought of as the Old World's combination Dream Street and Don Juan. The movie was made with the sound-on-film system controlled by the German-Dutch firm Tobis, corporate heirs to the Tri-Ergon concern. With an eye toward commanding the emerging European market for sound film, Tobis entered into a compact with its chief competitor, Klangfilm, a subsidiary of Allgemeine Elektrizitäts Gesellschaft (AEG). Early in 1929, the two businesses began comarketing their recording and playback technologies. As ERPI began to wire theaters around Europe, Tobis-Klangfilm claimed that the Western Electric system infringed on the Tri-Ergon patents, stalling the introduction of American technology in many places. Just as RCA had entered the movie business to maximize the value of its recording system, Tobis also established its own production houses, led by Germany's Tobis Filmkunst. Over the course of 1929, most of the major European filmmaking countries began joining Hollywood in the changeover to sound. Many of the trend-setting European talkies were shot abroad as production companies leased studios while their own were being converted or as they deliberately targeted markets speaking different languages. One of Europe's first two feature-length dramatic talkies was created in still a different sort of twist on multinational moviemaking: The Crimson Circle was a coproduction between director Friedrich Zelnik's Efzet-Film company and British Sound Film Productions (BSFP). In 1928, the film had been released as the silent Der Rote Kreis in Germany, where it was shot; English dialogue was apparently dubbed in much later using the De Forest Phonofilm process controlled by BSFP's corporate parent. It was given a British trade screening in March 1929, as was a part-talking film made entirely in the UK: The Clue of the New Pin, a British Lion production using the sound-on-disc British Photophone system. In May, Black Waters, a British and Dominions Film Corporation promoted as the first UK all-talker, received its initial trade screening; it had been shot completely in Hollywood with a Western Electric sound-on-film system. None of these pictures made much impact. The first successful European dramatic talkie was the all-British Blackmail. Directed by 29-year-old Alfred Hitchcock, the movie had its London debut June 21, 1929. Originally shot as a silent, Blackmail was restaged to include dialogue sequences, along with a score and sound effects, before its premiere. A British International Pictures (BIP) production, it was recorded on RCA Photophone, General Electric having bought a share of AEG in order to gain access to the Tobis-Klangfilm markets. Blackmail was a substantial hit; critical response was also positive—notorious curmudgeon Hugh Castle, for example, called it "perhaps the most intelligent mixture of sound and silence we have yet seen." On August 23, the modest-sized Austrian film industry came out with a talkie: G’schichten aus der Steiermark (Stories from Styria), an Eagle Film–Ottoton Film production. On September 30, the first entirely German-made feature-length dramatic talkie, Das Land ohne Frauen (Land Without Women), premiered. A Tobis Filmkunst production, about one-quarter of the movie contained dialogue, which was strictly segregated from the special effects and music. The response was underwhelming. Sweden's first talkie, Konstgjorda Svensson (Artificial Svensson), premiered on October 14. Eight days later, Aubert Franco-Film came out with Le Collier de la reine (The Queen's Necklace), shot at the Epinay studio near Paris. Conceived as a silent film, it was given a Tobis-recorded score and a single talking sequence–the first dialogue scene in a French feature. On October 31, Les Trois masques debuted; a Pathé-Natan film, it is generally regarded as the initial French feature talkie, though it was shot, like Blackmail, at the Elstree studio, just outside of London. The production company had contracted with RCA Photophone and Britain then had the nearest facility with the system. The Braunberger-Richebé talkie La Route est belle, also shot at Elstree, followed a few weeks later. Before the Paris studios were fully sound-equipped—a process that stretched well into 1930—a number of other early French talkies were shot in Germany. The first all-talking German feature, Atlantik, had premiered in Berlin on October 28. Yet another Elstree-made movie, it was rather less German at heart than Les Trois masques and La Route est belle were French; a BIP production with a British scenarist and German director, it was also shot in English as Atlantic. The entirely German Aafa-Film production Dich hab ich geliebt (Because I Loved You) opened three-and-a-half weeks later. It was not "Germany's First Talking Film," as the marketing had it, but it was the first to be released in the United States. In 1930, the first Polish talkies premiered, using sound-on-disc systems: Moralność pani Dulskiej (The Morality of Mrs. Dulska) in March and the all-talking Niebezpieczny romans (Dangerous Love Affair) in October. In Italy, whose once vibrant film industry had become moribund by the late 1920s, the first talkie, La Canzone dell'amore (The Song of Love), also came out in October; within two years, Italian cinema would be enjoying a revival. Several European nations with minor positions in the field also produced their first talking pictures—Belgium (in French), Denmark, Greece, and Romania. The Soviet Union's robust film industry came out with its first sound features in 1931: Dziga Vertov's nonfiction Entuziazm, with an experimental, dialogueless soundtrack, was released in the spring. In the fall, the Nikolai Ekk drama Putyovka v zhizn (The Road to Life), premiered as the state's first talking picture. Throughout much of Europe, conversion of exhibition venues lagged well behind production capacity, requiring talkies to be produced in parallel silent versions or simply shown without sound in many places. While the pace of conversion was relatively swift in Britain—with over 60 percent of theaters equipped for sound by the end of 1930, similar to the U.S. figure—in France, by contrast, more than half of theaters nationwide were still projecting in silence by late 1932. According to scholar Colin G. Crisp, "Anxiety about resuscitating the flow of silent films was frequently expressed in the [French] industrial press, and a large section of the industry still saw the silent as a viable artistic and commercial prospect till about 1935." The situation was particularly acute in the Soviet Union; as of spring 1933, fewer than one out of every hundred film projectors in the country was as yet equipped for sound. During the 1920s and 1930s, Japan was one of the world's two largest producers of motion pictures, along with the United States. Though the country's film industry was among the first to produce both sound and talking features, the full changeover to sound proceeded much more slowly than in the West. It appears that the first Japanese sound film, Reimai (Dawn), was made in 1926 with the De Forest Phonofilm system. Using the sound-on-disc Minatoki system, the leading Nikkatsu studio produced a pair of talkies in 1929: Taii no musume (The Captain's Daughter) and Furusato (Hometown), the latter directed by Mizoguchi Kenji. The rival Shochiku studio began the successful production of sound-on-film talkies in 1931 using a variable-density process called Tsuchibashi. Two years later, however, more than 80 percent of movies made in the country were still silents. Two of the country's leading directors, Ozu Yasujiro and Naruse Mikio, did not make their first sound films until 1935. As late as 1938, over a third of all movies produced in Japan were shot without dialogue. The end of silent film in the West and in Japan was imposed by the industry and the market, not by any inner need or natural evolution…. Silent cinema was a highly pleasurable and fully mature form. It didn't lack anything, least in Japan, where there was always the human voice doing the dialogues and the commentary. Sound films were not better, just more economical. As a cinema owner you didn't have to pay the wages of musicians and benshi any more. And a good benshi was a star demanding star payment. The viability of the benshi system facilitated a gradual transition to sound—allowing the studios to spread out the capital costs of conversion and their directors and technical crews time to become familiar with the new technology. The Mandarin-language Gēnǚ hóng mǔdān (歌女紅牡丹, Singsong Girl Red Peony), starring Butterfly Wu, premiered as China's first feature talkie in 1930. By February of that year, production was apparently completed on a sound version of The Devil's Playground, arguably quaIifying it as the first Australian talking motion picture; however, the May press screening of Commonwealth Film Contest prizewinner Fellers is the first verifiable public exhibition of an Australian talkie. In September 1930, a song performed by Indian star Sulochana, excerpted from the silent feature Madhuri (1928), was released as a synchronized-sound short, making it that nation's mini–Dream Street. The following year, Ardeshir Irani directed the first Indian talking feature, the Hindi-Urdu Alam Ara, and produced Kalidas, primarily in Tamil with some Telugu. The first Bengali-language film, Jamai Sasthi, and the first movie fully spoken in Telugu, Bhakta Prahlada appeared in 1931. In 1932, Ayodhyecha Raja became the first movie in which Marathi was spoken to be released (though Sant Tukaram was the first to go through the official censorship process); the first Gujarati-language film, Narsimha Mehta, and all-Tamil talkie, Kalava, debuted as well. The next year, Ardeshir Irani produced the first Persian-language talkie, Dukhtar-e-loor. Also in 1933, the first Cantonese-language films were produced in Hong Kong–Sha zai dongfang (The Idiot's Wedding Night) and Liang xing (Conscience); within two years, the local film industry had fully converted to sound. Korea, where byeonsa held a role and status similar to that of the Japanese benshi, in 1935 became the last country with a significant film industry to produce its first talking picture: Chunhyangjeon (春香傳/춘향전) is based on a seventeenth-century pansori folktale of which as many as 14 film versions have been made to date. In the short term, the introduction of live sound recording caused major difficulties in production. Cameras were noisy, so a soundproofed cabinet was used in many of the earliest talkies to isolate the loud equipment from the actors, at the expense of a drastic reduction in the ability to move the camera. For a time, multiple-camera shooting was used to compensate for the loss of mobility and innovative studio technicians could often find ways to liberate the camera for particular shots. The necessity of staying within range of still microphones meant that actors also often had to limit their movements unnaturally. Show Girl in Hollywood (1930), from First National Pictures (which Warner Bros. had taken control of thanks to its profitable adventure into sound), gives a behind-the-scenes look at some of the techniques involved in shooting early talkies. Several of the fundamental problems caused by the transition to sound were soon solved with new camera casings, known as "blimps," designed to suppress noise and boom microphones that could be held just out of frame and moved with the actors. In 1931, a major improvement in playback fidelity was introduced: three-way speaker systems in which sound was separated into low, medium, and high frequencies and sent respectively to a large bass "woofer," a midrange driver, and a treble "tweeter." As David Bordwell describes, technological improvements continued at a swift pace: "Between 1932 and 1935, [Western Electric and RCA] created directional microphones, increased the frequency range of film recording, reduced ground noise...and extended the volume range." These technical advances often meant new aesthetic opportunities: "Increasing the fidelity of recording...heightened the dramatic possibilities of vocal timbre, pitch, and loudness." Another basic problem—famously spoofed in the 1952 film Singin' in the Rain—was that some silent-era actors simply did not have attractive voices; though this issue was frequently overstated, there were related concerns about general vocal quality and the casting of performers for their dramatic skills in roles also requiring singing talent beyond their own. By 1935, rerecording of vocals by the original or different actors in postproduction, a process known as "looping," had become practical. The ultraviolet recording system introduced by RCA in 1936 improved the reproduction of sibilants and high notes. Tobis-Klangfilm has the exclusive rights to provide equipment for: Germany, Danzig, Austria, Hungary, Switzerland, Czechoslovakia, Holland, the Dutch Indies, Denmark, Sweden, Norway, Bulgaria, Romania, Yugoslavia, and Finland. The Americans have the exclusive rights for the United States, Canada, Australia, New Zealand, India, and Russia. All other countries, among them Italy, France, and England, are open to both parties. The agreement did not resolve all the patent disputes, and further negotiations were undertaken and concords signed over the course of the 1930s. During these years, as well, the American studios began abandoning the Western Electric system for RCA Photophone's variable-area approach–by the end of 1936, only Paramount, MGM, and United Artists still had contracts with ERPI. Studio heads, now forced into unprecedented decisions, decided to begin with the actors, the least palatable, the most vulnerable part of movie production. It was such a splendid opportunity, anyhow, for breaking contracts, cutting salaries, and taming the stars…. Me, they gave the salary treatment. I could stay on without the raise my contract called for, or quit, [Paramount studio chief B. P.] Schulberg said, using the questionable dodge of whether I'd be good for the talkies. Questionable, I say, because I spoke decent English in a decent voice and came from the theater. So without hesitation I quit. Lillian Gish departed, back to the stage, and other leading figures soon left acting entirely: Colleen Moore, Gloria Swanson, and Hollywood's most famous performing couple, Douglas Fairbanks and Mary Pickford. Buster Keaton was eager to explore the new medium, but when his studio, MGM, made the changeover to sound, he was quickly stripped of creative control. Though a number of Keaton's early talkies made impressive profits, they were artistically dismal. Several of the new medium's biggest attractions came from vaudeville and the musical theater, where performers such as Al Jolson, Eddie Cantor, Jeanette MacDonald, and the Marx Brothers were accustomed to the demands of both dialogue and song. James Cagney and Joan Blondell, who had teamed on Broadway, were brought west together by Warner Bros. in 1930. A few actors were major stars during both the silent and the sound eras: Richard Barthelmess, Clive Brook, Bebe Daniels, Norma Shearer, the comedy team of Stan Laurel and Oliver Hardy, and the incomparable Charlie Chaplin, whose City Lights (1931) and Modern Times (1936) employed sound almost exclusively for music and effects. Janet Gaynor became a top star with the synch-sound but dialogueless Seventh Heaven and Sunrise, as did Joan Crawford with the technologically similar Our Dancing Daughters (1928). Greta Garbo was the one non–native English speaker to achieve Hollywood stardom on either side of the great sound divide. This is the case of Art vs. Mechanical Music in theatrrs. The defendant stands accused in front of the American people of attempted corruption of musical appreciation and discouragement of musical education. Theatres in many cities are offering synchronised mechanical music as a substitute for Real Music. If the theatre-going public accepts this vitiation of its entertainment program a deplorable decline in the Art of Music is inevitable. Musical authorities know that the soul of the Art is lost in mechanisation. It cannot be otherwise because the quality of music is dependent on the mood of the artist, upon the human contact, without which the essence of intellectual stimulation and emotional rapture is lost. By the following year, a reported 22,000 U.S. moviehouse musicians had lost their jobs. In September 1926, Jack Warner, head of Warner Bros., was quoted to the effect that talking pictures would never be viable: "They fail to take into account the international language of the silent pictures, and the unconscious share of each onlooker in creating the play, the action, the plot, and the imagined dialogue for himself." Much to his company's benefit, he would be proven very wrong; between the 1927–28 and 1928–29 fiscal years, Warners' profits surged from $2 million to $14 million. Sound film, in fact, was a clear boon to all the major players in the industry. During that same 12-month span, Paramount's profits rose by $7 million, Fox's by $3.5 million, and Loew's/MGM's by $3 million. RKO, which hadn't even existed in September 1928 and whose parent production company, FBO, was in the Hollywood minor leagues, by the end of 1929 was established as one of America's leading entertainment businesses. Even as the Wall Street crash of October 1929 helped plunge the United States and ultimately the global economy into depression, the popularity of the talkies at first seemed to keep Hollywood immune. The 1929–30 exhibition season was even better for the motion picture industry than the previous, with ticket sales and overall profits hitting new highs. Reality finally struck later in 1930, but sound had clearly secured Hollywood's position as one of the most important industrial fields, both commercially and culturally, in the United States. In 1929, film box-office receipts comprised 16.6 percent of total spending by Americans on recreation; by 1931, the figure had reached 21.8 percent. The motion picture business would command similar figures for the next decade and a half. Hollywood ruled on the larger stage, as well. The American movie industry—already the world's most powerful—set an export record in 1929 that, by the applied measure of total feet of exposed film, was 27 percent higher than the year before. Concerns that language differences would hamper U.S. film exports turned out to be largely unfounded. In fact, the expense of sound conversion was a major obstacle to many overseas producers, relatively undercapitalized by Hollywood standards. The production of multiple versions of export-bound talkies in different languages, a common approach at first, largely ceased by mid-1931, replaced by post-dubbing and subtitling. Despite trade restrictions imposed in most foreign markets, by 1937, American films commanded about 70 percent of screen time around the globe. [B]ecause the studios were forced to streamline operations and rely on their own resources, their individual house styles and corporate personalities came into much sharper focus. Thus the watershed period from the coming of sound into the early Depression saw the studio system finally coalesce, with the individual studios coming to terms with their own identities and their respective positions within the industry. The other country in which sound cinema had an immediate major commercial impact was India. As one distributor of the period said, "With the coming of the talkies, the Indian motion picture came into its own as a definite and distinctive piece of creation. This was achieved by music." From its earliest days, Indian sound cinema has been defined by the musical–Alam Ara featured seven songs; a year later, Indrasabha would feature 70. While the European film industries fought an endless battle against the popularity and economic muscle of Hollywood, ten years after the debut of Alam Ara, over 90 percent of the films showing on Indian screens were made within the country. Most of India's early talkies were shot in Bombay, which remains the leading production center, but sound filmmaking soon spread across the multilingual nation. Within just a few weeks of Alam Ara's March 1931 premiere, the Calcutta-based Madan Pictures had released both the Hindi Shirin Farhad and the Bengali Jamai Sasthi. The Hindustani Heer Ranjha was produced in Lahore, Punjab, the following year. In 1934, Sati Sulochana, the first Kannada talking picture to be released, was shot in Kolhapur, Maharashtra; Srinivasa Kalyanam became the first Tamil talkie actually shot in Tamil Nadu. Once the first talkie features appeared, the conversion to full sound production happened as rapidly in India as it did in the United States. Already by 1932, the majority of feature productions were in sound; two years later, 164 of the 172 Indian feature films were talking pictures. From 1934 through the present, with the sole exception of 1952, India has been among the top three movie-producing countries in the world every single year. In the first, 1930 edition of his global survey The Film Till Now, cinema pundit Paul Rotha declared, "A film in which the speech and sound effects are perfectly synchronised and coincide with their visual image on the screen is absolutely contrary to the aims of cinema. It is a degenerate and misguided attempt to destroy the real use of the film and cannot be accepted as coming within the true boundaries of the cinema." Such opinions were not rare among those who cared about cinema as an art form; Alfred Hitchcock, though he directed the first commercially successful talkie produced in Europe, held that "the silent pictures were the purest form of cinema" and scoffed at many early sound films as delivering little beside "photographs of people talking." Most latter-day film historians and aficionados agree that silent film had reached an aesthetic peak by the late 1920s and that the early years of sound cinema delivered little that was comparable to the best of the silents. For instance, despite fading into relative obscurity once its era had passed, silent cinema is represented by 11 films in Time Out's Centenary of Cinema Top One Hundred poll, held in 1995. The earliest sound film to place is the French L'Atalante (1934), directed by Jean Vigo; the earliest Hollywood sound film to qualify is Bringing Up Baby (1938), directed by Howard Hawks. The first year in which sound film production predominated over silent film—not only in the United States, but also in the West considered as a whole—was 1929; yet the years 1929 through 1931 (for that matter, 1929 through 1933) are represented by three dialogueless pictures (Pandora's Box [1929; often misdated 1928], Zemlya , City Lights ) and zero talkies in the Time Out poll. Peter Lorre in M (1931). "Many early talkies felt they had to talk all the time," writes Roger Ebert, "but [director Fritz] Lang allows his camera to prowl through the streets and dives, providing a rat's-eye view." The first sound feature film to receive near-universal critical approbation was Der Blaue Engel (The Blue Angel); premiering on April 1, 1930, it was directed by Josef von Sternberg in both German and English versions for Berlin's UFA studio. The first American talkie to be widely honored was All Quiet on the Western Front, directed by Lewis Milestone, which premiered April 21. The other internationally acclaimed sound drama of the year was Westfront 1918, directed by G. W. Pabst for Nero-Film of Berlin. Cultural historians consider the French L'Âge d'or, directed by Luis Buñuel, which appeared in October 1930, to be of great aesthetic import, though more as a signal expression of the surrealist movement than as cinema per se. 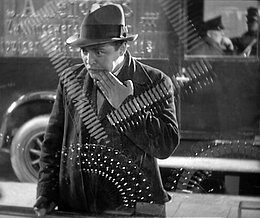 The earliest sound movie now acknowledged by most film historians as a masterpiece is Nero-Film's M, directed by Fritz Lang, which premiered May 11, 1931. "Talking film is as little needed as a singing book." Such was the blunt proclamation of critic Viktor Shklovsky, one of the leaders of the Russian formalist movement, in 1927. While some regarded sound as irreconcilable with film art, others saw it as opening a new field of creative opportunity. The following year, a group of Soviet filmmakers, including Sergei Eisenstein, proclaimed that the use of image and sound in juxtaposition, the so-called contrapuntal method, would raise the cinema to "unprecedented power and cultural height. Such a method for constructing the sound-film will not confine it to a national market, as must happen with the photographing of plays, but will give a greater possibility than ever before for the circulation throughout the world of a filmically expressed idea." [T]o render the half-musical impressions of factory sounds in a complex audio world that moved from absolute music to the purely documentary noises of nature. In this film every intermediate stage can be found: such as the movement of the machine interpreted by the music, the noises of the machine dominating the musical background, the music itself is the documentary, and those scenes where the pure sound of the machine goes solo. Many similar experiments were pursued by Dziga Vertov in his 1931 Entuziazm and by Charlie Chaplin in Modern Times, a half-decade later. A few innovative commercial directors immediately saw the ways in which sound could be employed as an integral part of cinematic storytelling, beyond the obvious function of recording speech. In Blackmail, Hitchcock manipulated the reproduction of a character's monologue so the word "knife" would leap out from a blurry stream of sound, reflecting the subjective impression of the protagonist, who is desperate to conceal her involvement in a fatal stabbing. In his first film, the Paramount Applause (1929), Rouben Mamoulian created the illusion of acoustic depth by varying the volume of ambient sound in proportion to the distance of shots. At a certain point, Mamoulian wanted the audience to hear one character singing at the same time as another prays; according to the director, "They said we couldn't record the two things—the song and the prayer—on one mike and one channel. So I said to the sound man, 'Why not use two mikes and two channels and combine the two tracks in printing?'" Such methods would eventually become standard procedure in popular filmmaking. Le Million never lets us forget that the acoustic component is as much a construction as the whitewashed sets. [It] replaced dialogue with actors singing and talking in rhyming couplets. Clair created teasing confusions between on- and off-screen sound. He also experimented with asynchronous audio tricks, as in the famous scene in which a chase after a coat is synched to the cheers of an invisible football (or rugby) crowd. These and similar techniques became part of the vocabulary of the sound comedy film, though as special effects and "color," not as the basis for the kind of comprehensive, non-naturalistic design achieved by Clair. Outside of the comedic field, the sort of bold play with sound exemplified by Melodie der Welt and Le Million would be pursued very rarely in commercial production. Hollywood, in particular, incorporated sound into a reliable system of genre-based moviemaking, in which the formal possibilities of the new medium were subordinated to the traditional goals of star affirmation and straightforward storytelling. As accurately predicted in 1928 by Frank Woods, secretary of the Academy of Motion Picture Arts and Sciences, "The talking pictures of the future will follow the general line of treatment heretofore developed by the silent drama…. The talking scenes will require different handling, but the general construction of the story will be much the same." ↑ Scott Eyman. The Speed of Sound: Hollywood and the Talkie Revolution 1926–1930. (New York: Simon & Schuster, 1997), ISBN 0684811626), 30–31. ↑ Donald Crafton. The Talkies: American Cinema's Transition to Sound, 1926–1931. (New York: Charles Scribner's Sons, 1997. ISBN 0684195852), 66; James A. Hijiya. Lee De Forest and the Fatherhood of Radio. (Cranbury, NJ: Associated University Presses, 1992. ISBN 0934223238), 103—both give 1924. ↑ Quoted in Betty Lasky. RKO: The Biggest Little Major of Them All. (Santa Monica, CA: Roundtable, 1989. ISBN 0915677415), 20. ↑ Steven E. Schoenherr, (c) 1999, Motion Picture Sound 1910–1929. and Sound Recording Research at Bell Labs. San Diego.edu. ↑ Clive Hirschhorn. The Warner Bros. Story. (New York: Crown, 1979. ISBN 0517538342), 59, 60. ↑ H. Mark Glancy, "Warner Bros. Film Grosses, 1921–51: The William Schaefer Ledger," Historical Journal of Film, Radio and Television (March 1995): 4–5; Thomas Schatz. The Genius of the System: Hollywood Filmmaking in the Studio Era. (London: Faber and Faber, 1998. ISBN 0571195962), 64, says the production cost of Lights of New York totaled $75,000. ↑ Patrick Robertson. Film Facts. (New York: Billboard Books, 2001. ISBN 0823079430), 180. ↑ Rachael Low. The History of the British Film 1918–1929. (The History of British Film, Volume IV). (New York: Routledge, , 1997. ISBN 0415156491), 191. ↑ How the Pictures Learned to Talk: The Emergence of German Sound Film historical survey; part of the filmportal.de website. ↑ Donald Spoto. The Dark Side of Genius: The Life of Alfred Hitchcock. (New York: Ballantine, 1984. ISBN 034531462X), 136. ↑ Reinhold Wagenleitner. Coca-Colonization and the Cold War: The Cultural Mission of the United States in Austria After the Second World War, trans. Diana M. Wolf. (Chapel Hill: University of North Carolina Press, 1994. ISBN 0807821497), 253; Robertson, 10. ↑ Colin G. Crisp. The Classic French Cinema, 1930–1960. (Bloomington: Indiana University Press, 1997. ISBN 0253211158), 103. ↑ James Chapman. Cinemas of the World: Film and Society from 1895 to the Present. (London: Reaktion Books, 2003. ISBN 1861891628), 82; Chronomedia: 1929 chronology of media developments during the year—part of the Terra Media.co.uk. ↑ Marek Haltof. Polish National Cinema. (New York: Berghahn Books, 2002. ISBN 157181275X), 24. ↑ Crisp, 101; Crafton, 155. ↑ Joseph L. Anderson and Donald Richie. The Japanese Film: Art and Industry, expanded ed. (Princeton, NJ: Princeton University Press, 1982. ISBN 0691053510), 77. ↑ Quoted in Freda Freiberg, "The Transition to Sound in Japan," in History on/and/in Film, ed. Tom O'Regan and Brian Shoesmith, (Perth: History & Film Association of Australia, 1987), 76. ↑ Eric Reade. History and Heartburn: The Saga of Australian Film, 1896–1978. (East Brunswick, NJ: Associated University Presses, 1981. ISBN 0838630820), 79–80. ↑ K. Pradeep, "When the Stars Talked"', The Hindu, (March 17, 2006); M. L. Narasimham, [http://www.hinduonnet.com/thehindu/fr/2006/09/08/stories/2006090802530100.htm "A Leader and a Visionary", The Hindu (September 8, 2006); Ashish Rajadhyaksha and Paul Willemen. BFI Encyclopedia of Indian Cinema, rev. ed. (Oxford and New York: BFI/Oxford University Press, (1999) 2002. ISBN 085170669X), 254; Tamil Cinema History—The Early Days: 1916–1936 part of the IndoLink Tamil Cinema website. ↑ Linda Lai, "Hong Kong Cinema in the 1930s: Docility, Social Hygiene, Pleasure-Seeking & the Consolidation of the Film Industry", Screening the Past 11 (November 1, 2000), "The Cantonese Arena." ↑ Andre J. Millard. America on Record: A History of Recorded Sound, 2d ed. (Cambridge: Cambridge University Press, 2005. ISBN 0521835151), 189. ↑ David Bordwell, "The Introduction of Sound," chap. in David Bordwell, Janet Staiger, and Kristin Thompson. The Classical Hollywood Cinema: Film Style & Mode of Production to 1960. 298–308. (New York: Columbia University Press, 1985. ISBN 0231060548), 300–301, 302. ↑ Edward Bernds. Mr. Bernds Goes to Hollywood: My Early Life and Career in Sound Recording at Columbia With Frank Capra and Others. (Lanham, MD: Scarecrow Press, 1999. ISBN 0810836025), part 1. ↑ "Outcome of Paris" Accord signed. Total Interchangeability—Globe Divided into Three Patent Zones—Patent Exchange. Film-Kurier No. 171, (7/22/1930)online, . (in English) filmportal.de. Retrieved November 20, 2009. Example of a variable-area sound track—the width of the white area is proportional to the amplitude of the audio signal at each instant. ↑ Crafton, 461, 491, 498–501, 508. ↑ Louise Brooks, "Mr. Pabst," Image 5 (September 7, 1956). ↑ Tom Dardis. Keaton: The Man Who Wouldn't Lie Down. (Middlesex, UK: Penguin, 1980. ISBN 0140057013), 190–191, contains an analysis of the profitability of Keaton's early sound films. ↑ Preston J. Hubbard, "Synchronized Sound and Movie-House Musicians, 1926–29," American Music 3 (4) (Winter (1985): 429. ↑ "Canned Music on Trial". scriptorium.lib.duke. ↑ Stuart Oderman. Lillian Gish: A Life on Stage and Screen. (Jefferson, NC: McFarland, 2000. ISBN 0786406445), 188. ↑ Douglas Gomery, "The Coming of Sound: Technological Change in the American Film Industry," in Technology and Culture—The Film Reader, ed. Andrew Utterson, (Oxford and New York: Routledge/Taylor & Francis, (1985) republished 2005. ISBN 0415319846), 66–67. ↑ Joel W. Finler. The Hollywood Story. (New York: Crown, 1988. ISBN 0517565765), 34. ↑ Richard B. Jewell, with Vernon Harbin. The RKO Story. (New York: Arlington House/Crown, 1982. ISBN 0517546566), 9. ↑ Quoted in Tejaswini Ganti. Bollywood: A Guidebook To Popular Hindi Cinema. (Routledge Film Guidebooks. 2004. ISBN 0415288541), 11. ↑ Rajadhyaksha and Willemen, 254; Lalit Mohan Joshi. Bollywood: Popular Indian Cinema. (London: Dakini, 2003. ISBN 0953703223), 14. ↑ Randor Guy, "First Film to Talk in Kannada", The Hindu, (December 31, 2004) ; Tamil Cinema History—The Early Days: 1916–1936. ↑ Rajadhyaksha and Willemen, 30, 32. ↑ Quoted in James Agate. Around Cinemas. (New York: Arno Press/New York Times, 1972. ISBN 0405038887), 82. ↑ Quoted in Chapman, 93. ↑ Time Out Film Guide, Eighth ed., edited by John Pym. (New York: Penguin, 2000. ISBN 014028365X), x–xi (top 100 poll conducted in 1995); Village Voice : 100 Best Films of the 20th Century (2001), filmsite.org. ; Sight and Sound Top Ten Poll 2002. listing all 60 films to receive five or more votes. bfi.org. ↑ Roger Ebert. The Great Movies. (New York: Broadway Books, 2002. ISBN 0767910389), 277. ↑ Quoted in Peter Kenez. Cinema and Soviet Society from the Revolution to the Death of Stalin. (London and New York: I.B. Tauris, 2001. ISBN 1860646328), 123. ↑ Sergei Eisenstein, et al. (1928). "A Statement," in his Film Form: Essays in Film Theory, trans. Jay Leyda, 257–260. (New York: Meridian,  1957. ), 259. ↑ William Moritz. Optical Poetry: The Life and Work of Oskar Fischinger. (Bloomington: Indiana University Press, 2003. ISBN 0861966341), 25. ↑ Quoted in Karel Dibbets, "High-tech Avant-garde: Philips Radio," in Joris Ivens and the Documentary Context, ed. Kees Bakker, 72–86. (Amsterdam: Amsterdam University Press, 1999. ISBN 905356425X), 85–86. ↑ Quoted in Dibbets, 85. ↑ See Spoto, 132–133; François Truffaut. Hitchcock, rev. ed. (New York: Simon & Schuster, 1984. ISBN 0671526014), 63–65. ↑ Tom Milne, "Rouben Mamoulian," in Cinema: A Critical Dictionary, ed. Richard Roud, 658–663. (New York: Viking, 1980. ISBN 0670222577), 659; See also Crafton, 334–338. ↑ Quoted in Bordwell, 1985, 298. See also David Bordwell and Kristin Thompson. "Technological Change and Classical Film Style," chap. in Tino Balio. Grand Design: Hollywood as a Modern Business Enterprise, 1930–1939. 109–141. (Berkeley: University of California Press, 1995. ISBN 0520203348), 125. Bazin, André, "Cinema and Exploration," in his What Is Cinema?, trans. and ed. Hugh Gray, 154–163. Berkeley and Los Angeles: University of California Press, 1967 [1958–65]). Bernds, Edward. Mr. Bernds Goes to Hollywood: My Early Life and Career in Sound Recording at Columbia With Frank Capra and Others. Lanham, MD: Scarecrow Press, 1999, (excerpted online). ISBN 0810836025. Bhuyan, Avantika. "Going, Going, Gone…," Alarm Ara. Screen Weekly March 31, 2006, (available online). screenindia.com. Brooks, Louise, "Mr. Pabst," Image 5 (September 7, 1956). Chatterji, Shoma A., "The Culture-specific Use of Sound in Indian Cinema," paper presented at International Symposium on Sound in Cinema, London, April 15–18, 1999, (available online). Eisenstein, Sergei, et al. (1928). "A Statement," in his Film Form: Essays in Film Theory (1957 ), trans. Jay Leyda, 257–260. New York: Meridian (available online). Freiberg, Freda. "The Transition to Sound in Japan," in History on/and/in Film, ed. Tom O'Regan and Brian Shoesmith, 76–80. Perth: History & Film Association of Australia, 1987, (available online). __________. "Comprehensive Connections: The Film Industry, the Theatre and the State in the Early Japanese Cinema," Screening the Past 11 (November 1, 2000), (available online). Screening the Past. Glancy, H. Mark, "Warner Bros. Film Grosses, 1921–51: The William Schaefer Ledger," Historical Journal of Film, Radio and Television (March 1995), (available online). Guy, Randor, "First Film to Talk in Kannada," The Hindu, (December 31, 2004). (available online). Hubbard, Preston J. "Synchronized Sound and Movie-House Musicians, 1926–29," American Music 3 (4) (Winter 1985). Lai, Linda. "Hong Kong Cinema in the 1930s: Docility, Social Hygiene, Pleasure-Seeking & the Consolidation of the Film Industry," Screening the Past 11 (November 1, 2000), (available online). Łotysz, Sławomir. "Contributions of Polish Jews: Joseph Tykociński–Tykociner (1877–1969), Pioneer of Sound on Film," Gazeta 13 (3) (winter–spring 2006), (available online). Moone, Tom, "Joseph Tykociner: Pioneer of Sound on Film," Ingenuity 9 (1) (March 2004), (available online). Narasimham, M. L. "A Leader and a Visionary," The Hindu (September 8, 2006), (available online). "Outcome of Paris: Accord Signed/Total Interchangeability—Globe Divided into Three Patent Zones—Patent Exchange" Film-Kurier July 22, 1930), (available online). Pradeep, K., "When the Stars Talked," The Hindu March 17, 2006, (available online). Sponable, E. I., "Historical Development of Sound Films," Journal of the Society of Motion Picture Engineers 48 (4–5) (April/May 1947), (available online). Associated Press, "Talking Movies: They'll Never Take, Asserts Film Company's Head" (September 3, 1926), (available online). Aldred, John, 100 Years of Cinema Loudspeakers filmsound.org. Hollywood Goes for Sound Terra Media.co.uk. Kenrick, John, 1927-30: Hollywood Learns To Sing musicals.101.com. Nichols, Bill, Documentary and the Coming of Sound filmsound.org. Progressive Silent Film List (PSFL)/Early Sound Films Silent Era. Ulano, Mark, "Moving Pictures That Talk" filmsound.org. History of "Motion picture (sound film)"
This page was last modified on 25 October 2018, at 15:21.